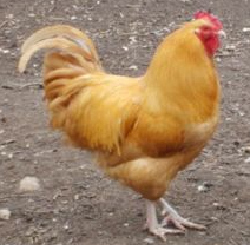 Feral chickens exist in most every country, though the most feral chicken would probably the Red Junglefowl, the common ancestor of all domesticated chicken breeds today. The Red Junglefowl most likely originated in Thailand and has spread with similar pheasant-like jungle birds through Asia. More than 8000 years ago man took Junglefowl into his care and began the domestication process that has blossomed world-wide. Another example of a feral chicken is the Moa of the Hawaiian Islands, brought by Polynesian explorers hundreds of years ago. Genetically the Moa is a Red Junglefowl, though there has been some interbreeding with farm chickens on the islands, endangering this species of wild chicken. For feral chickens or any species to revert to being feral after domestication means it is no longer depending directly on man to provide for its food, shelter, and survival. Although many feral animals, seem to flock to human habitats to live off scraps, garbage and hand-outs. Pet species that turn feral, like cats and dogs, generally avoid and fear human contact from lack of imprinting and learning to trust humans at an early age. A feral chicken could be described as one that was hatched and raised outside the care of man, relying on natural resources for survival. It takes a domesticated chicken with excellent instincts to survive without man’s help. These, now feral chickens, would need to be able to fly up to a tree roost at night for safety, to scratch for enough bugs, worms, seeds and greens to feed it each day, and for a hen, she would have to be able to choose a nesting site well camouflaged, and be able to blend in, to allow her to keep eggs warm for 21 days on the ground. Once hatched, she and her chicks are vulnerable to cats and dogs, hawks and snakes and all manner of predators, until chicks are big enough and feathered enough to roost somewhere safe. She protects them with her life instead of buildings and wire and must lead them to food and water sources, not containers. Feral chickens may have been hatched that way, or chosen a life away from people. Domesticated chickens, provided with all the things that make them happy, like: food, water, shelter and other chickens to keep them company will usually choose to stay domesticated. Though some breeds, like game fowl, very similar to their wild jungle cousins, may be best equipped physically and instinctual like to survive in the wild. Our domesticated chicken breeds usually enjoy the routines and benefits of life on the farm, coops, fences and all; rewarding our good care with eggs, sometimes meat, and sometimes a nice balance of life with nature. Though most chicken breeds have lived separate and very different lives from feral chickens, they have retained, for the most part, instincts for the survival of their species. Not too long ago I watched a program about dogs and their wild ancestors. The point was raised about falling numbers in wild wolf populations from ages past and what impact that has on the environment. Another point was raised that I found quite humorous. It was a theory that the wolf started the ultimate survival project, when he drew near the first human camp fire and accepted a hand-out; that the wolf has been thriving and been pampered in all sizes and shapes, from the smallest Chihuahua to the tallest Great Dane, in human households around the globe. I’m not sure if Red Junglefowl, the ultimate feral chickens, haven’t accomplished something similar to the wolf. We cage them, selectively breed them, take their eggs, eat them, but in order to keep them in our lives and keep them productive and healthy, we have to take good care of them; and that means work.